The Walt Disney Company, known for productions whose life lessons tickle our funny bones and tug at people's heartstrings, has also stepped up to become a bridge between China and the US. 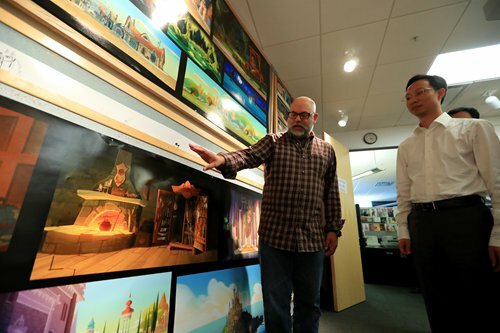 On August 26, Disney brought 20 of China's leading animators, animation company executives and government officials to California for a three-week training to learn Disney's secrets of success. Disney has been implementing a multi-year training program since 2015 to help China's homegrown animators to succeed in the global animation market, while also sending their own people to China to understand the local market. "Everybody understands China is a big market... but Disney has always understood that for us to function in China we need to tune into Chinese culture and we need to become part of the entertainment industry and the animation industry in China," said Marc Handler, Disney's creative director, during an interview with the Xinhua News Agency this week in Los Angeles. That has enabled Disney to do co-productions with their local Chinese colleagues, such as Stoney & Rocky, a show Disney did with Chinese animation studio Toonmax, and Stitch & Ai, a popular series set in Anhui Province. To support local fare, Disney also aired P. King Duckling - the first time a Chinese TV series was imported to the US and broadcast on a Disney channel. Also, one of Disney's own hit series, Sofia the First, was the first US TV series permitted to air in the Chinese mainland in years. "We shared our project plan about Chinese mythology, hoping to improve it in discussion with Disney," said Fang Ling, chief operating officer of CCTV Animation. To help, Disney is bringing out their big guns. This year's program is a deep dive into all things Tangled: the Series, Disney's hit new animated TV series, developed by Chris Sonnenburg. It is based on Disney's hit 2010 film Tangled, which grossed $592 million worldwide. The series follow the adventures of the Brothers Grimm's magical-haired, fairytale heroine, Rapunzel and her wacky friends. Chris Sonnenburg, executive producer and supervising director of the series, told Xinhua: "It's been super fun to have the [Chinese] group come through and explain to them how the show is created ... I love sharing the entire process of production and what it takes to do it." While attending in-depth classes, participants get a rare chance to peek behind the curtain at Disney's incomparable hit-making machine. "Chinese animators are impressed by the specialized operation of Disney. We are trying to absorb advanced experiences from them as much as possible in three weeks," said Fang. Yu Shengjun, producer of the Chinese animated series Little Artist Remy Bear, was equally excited about the opportunity. "It's helpful for the development of Chinese animation to gain advanced experience and technology from Hollywood. I use the expertise learned from Disney to improve my work, attracting more buyers from other countries."